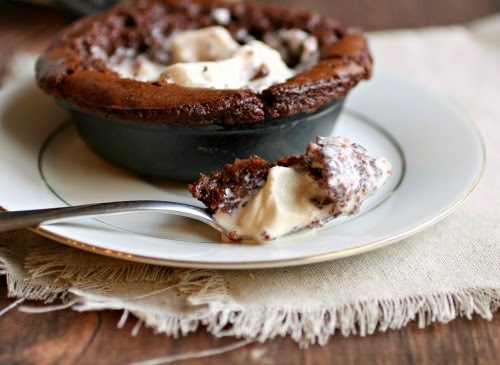 Let's say that you're in the mood for an ooey gooey chocolatey dessert. OK, that would be pretty much every day. But let's say that you also wanted to make something pretty simple and no fuss. And a little special, but still no fuss. And maybe even a little romantic? 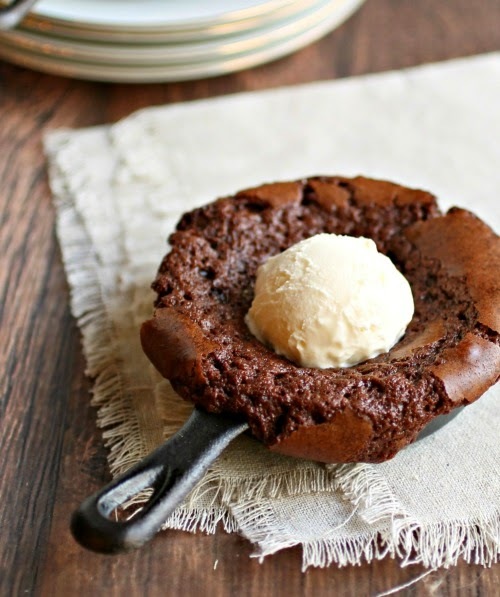 These skillet brownies are so what you're looking for! Not really a new idea, of course, but I took it up a notch with a cherry cheesecake filling. No frilly crusts to roll out, no hoping a cake will rise, no worrying that it's not done in the middle. Gooey and slightly under-baked in the center is the right way to make these brownies. And when you drop a scoop of vanilla ice cream on top and dip your spoon into the chocolaty, cheesecakey (what do you mean that's not a word??) warm molten center and it mixes with the cold creamy ice cream, you will close your eyes and savor every bite. And now I want another one. Enjoy! 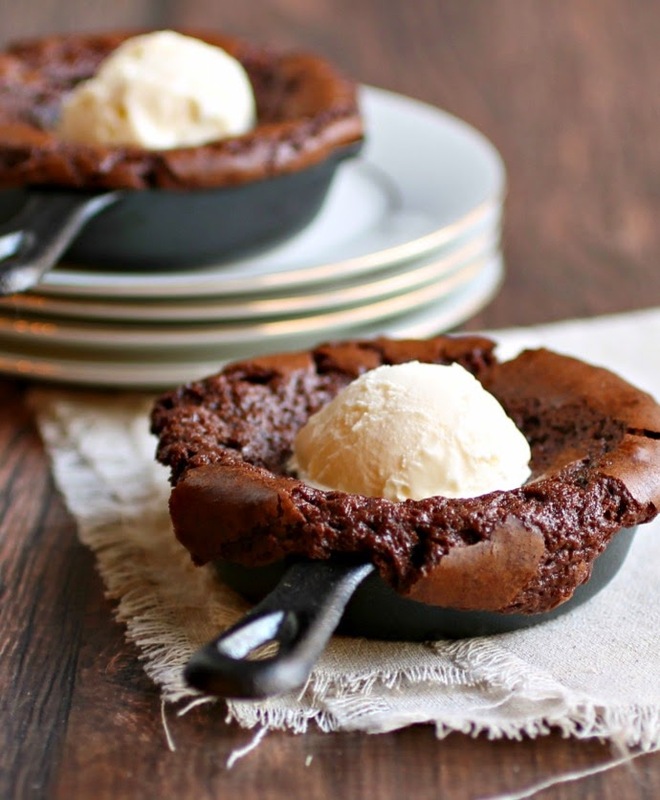 Melt the butter and chocolate chips in a bowl set over a pot of simmering water. Set aside to cool slightly. Whisk together the egg, vanilla, sugar, flour, baking powder and salt. Stir in the cooled chocolate. Pour evenly into three 3 1/2" cast iron skillets or two slightly larger ones. Bake for 10 minutes. While the skillets are in the oven, mix together the cream cheese and sugar. Gently swirl in the preserves. Remove the skillets from the oven after the 10 minutes, place an equal amount of the cheesecake filling in the middle of each skillet and gently run a butter knife through once or twice. It doesn't have to be perfectly incorporated. Return the skillets to the oven for an additional 10 minutes. Serve warm with a scoop of vanilla ice cream on top. I can already see me getting so excited about eating this that I'd burn my fingers on the hot skillet right after I took it out of the oven. You totally made this just for me, didn't you, Anita? How did you know how much I love ooey gooey brownies, cherry cheesecake and vanilla ice cream? I'm going to have to fight Renee for these! um, WOW. All I can say is wow! Delish! 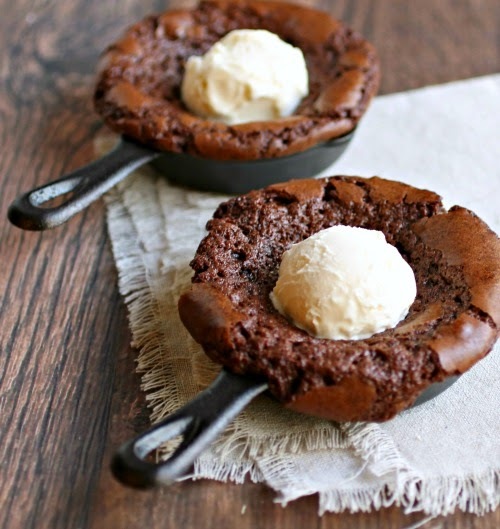 Sorry this comment is so short, but you had me at brownie...then I saw the picture...and the drool started. Will you be my valentine? Please say yes! What can we use if we don't have the cast iron skillets? If you have any small pie dishes or other small oven safe pans, those should work.